Congratulations to Girls Varsity Tennis Player Julia Gonda '17 on being named a San Diego Union Tribune Prep Athlete of the Week for the week of November 2nd through November 6th. 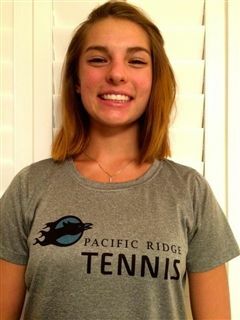 The Pacific Ridge junior was one of six San Diego high school athletes recognized. Julia was selected for her contributions to the Firebird's incredible playoff run and CIF Division II Championship win over Patrick Henry High School.